In 2011, the Education Endowment Foundation (EEF) awarded a grant to help support schools through TEEP training – more than fifty schools will benefit between April 2012 and March 2016. It is one of sixty-eight projects led by the foundation since its launch in 2011 and aims to provide additional support for teachers in schools with the most vulnerable students. The EEF is funding the further development of the TEEP programme to include additional new strands of training and materials. Schools will be randomly selected for training and grouped into four separate year groups, allowing an extensive evaluation of the effectiveness of TEEP to be produced. The evaluation will be provided by The Institute for Effective Education, University of York. Schools who are part of the project were all close to government floor targets at the time of selection and were put through a rigorous process, ensuring a suitable environment was present for TEEP to be embedded. 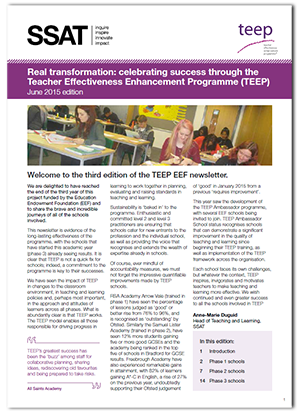 Our annual TEEP and EEF report tells the stories of the schools involved in the programme to date, providing extensive insight into the impact TEEP is having. Read them below. In addition, read further stories from schools involved in TEEP – visit our case study page or watch short films made by some of the schools themselves.